Covering cultural, economic, political and environmental issues, this broad-ranging and user-friendly volume explores both the common heritage and collective history of the region, as well as the distinctive histories of the individual states. Key features include a wide-ranging political and thematic chronologies, maps for clear visual reference, special topics such as the economy, the environment and culture, a full list of office holders and extensive biographies of prominent people in all fields, a glossary of specialist terms. 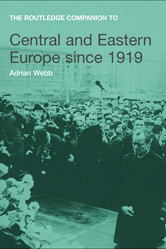 With a wealth of chronological, statistical and tabular data, this handy book is an indispensable resource for all those who wish to understand the complex history of Central and Eastern Europe.